On December 26, Dave and I celebrated our 12th anniversary. A few weeks beforehand, Dave asked me to find a babysitter and suggested we would go out to see a movie. For some reason I didn’t question, even though we haven’t seen a movie together in the theater for over two years. So on the 26th I spoke to our babysitter and she told me she was only available until 7 pm. Dave told me we actually needed a babysitter until 10 pm! And that was my first hint that Dave had decided to surprise me! When I posted on facebook about needing a babysitter, my friend commented that she and her kids (who babysit for us at times) were going to see Cirque du Soleil. And I realized what the surprise must be! 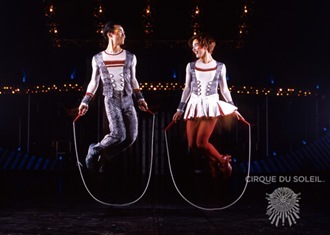 Because you see, when Dave and I were in Vegas for our 1st anniversary, we saw Cirque du Soleil ‘O’ and loved it! And for our 12th anniversary, Dave got us tickets to see Quidam. 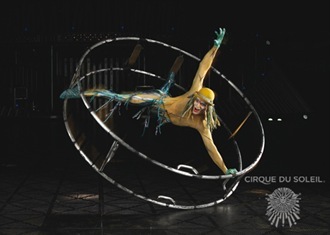 Quidam is described as “a young girl’s escape into a world of imagination.” And some imagination she must have. Being that the lyrics are not in English, it isn’t easy to understand what is happening in the story, but the acts were lovely to watch. I felt that some of the acts could have been shorter, but did enjoy watching the various acrobats and gymnasts. Seated behind us were a group of older individuals who oohed and ahhed over every movement made on the stage, so that was a little distracting, but did provide some comic relief as well! There were also a few scenes that involved audience members. If you are seated in the front section, beware, you may be brought onto the stage! Or maybe these people are placed in the audience beforehand – it’s hard to say. The audience members scenes were funny, until they got to be too long! The entire show was 2.5 hours long, including a 20 minute intermission. Dave got a great deal on the the tickets and we ended up paying more for our babysitter than for the the show! 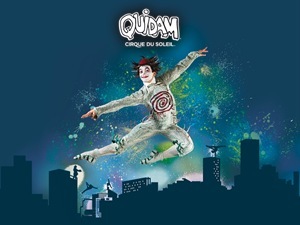 We enjoyed Quidam. It was no ‘O,’ but I’m glad we went and I’m glad Dave surprised me for our 12th anniversary! To top off my excitement, #29 on my 35 things to do in my 35th year list was “go to a show!” Done!